Sewing your own laptop case will save you money and protect your notebook computer. Make a basic case following these directions, and feel free to be creative by adding pockets or straps to customize your laptop case even more. Pattern material—newsprint paper, the back side of gift wrapping paper, interfacing or similar material. Fabric (amount will depend on your laptop pattern) and optional double fold bias tape to enclose the upper edge of the case depending on the fabric you are using. You will need equal amounts of the outer fabric and the lining. 1" or wider hook and loop tape (Velcro) to close the case. The amount you need will depend on how you design the flap and the security you want. A: The distance around the laptop from the top edge to the other top edge. Add 1/2" for a seam allowance at the top of the case. This is shown above in green. B: The amount of flap you want, starting at the second top edge to the amount you want to overlap the front of the case. Add a 1/2" for a seam allowance at the edge of the flap. This is shown above in yellow. C: The thickness of the laptop. This is shown above in red. D: The width of the laptop. This is shown above in blue. 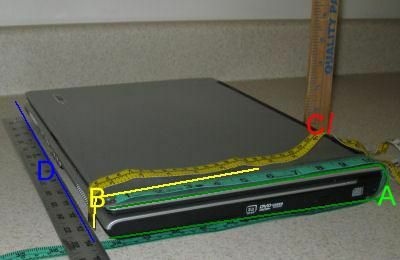 Add the thickness of the laptop measurement (C) to the width of the laptop measurement (D). This will be the width of your pattern and is shown as D in the photo. Add the distance around the laptop (A) to the amount of flap you want (B). This will be the length of your pattern pieces. Using a carpenters square, rotary cutter rulers or pattern making the material with a grid to maintain perfect square, transfer the measurements to your pattern material. Create the line for where the flap starts using measurement b from the end of the pattern piece. Add a 1/2" to the long side edges as a seam allowance. Mark where the flap begins. Design the front flap into the shape desired. Keep both sides of the flap even by folding the pattern in half lengthwise and trim the flap as desired. You can create angles or round off the edge as you desire but remember to leave a large enough area for the hook and loop tape to create a secure closing. Choose a fabric that will not scratch the laptop and one that will hopefully help protect the laptop from bumps and moisture. Following these directions, it will be possible to use a weather-resistant nylon fabric or a vinyl fabric for the outside of the case and a fleece or flannel lining to provide a soft interior in the case. Use the straight grain of the fabric to run parallel with the edges of the pattern piece. Using preshrunk fabric, cut out one of the patterns from the outer fabric and cut out one of the lining fabric. In the seam allowance area, transfer the mark where the flap begins. Fold the straight end of the fabric up to the flap mark with the right sides of the fabric together. Align the edges and sew a seam using a 1/2" seam allowance. Re-fold the case so the seam is laying on the bottom of the bag as shown in the photo. Using the measurement you have for the thickness of the laptop, measure across the seam and mark where the thickness is achieved. Sew across the seam at the mark as shown in the photo. Trim off the triangle and apply a seam finish. Working on the right side of the lining case, center the hook portion of the hook and loop tape on the flap, 3/4" away from the cut edge. Sew the tape to the case by sewing along the edges of the tape, pivoting with the needle down at each corner. Turn the outer case right-side out and insert it inside the lining case so the right sides of both cases are against each other. Match the seams and align edges. Pin in place, using double pins to remind you to leave an area of the inside top edge open. Sew the edges together, using a 1/2" seam allowance, leaving an area open on the inside top edge to turn the case. Clip the case at the seams and any turns created on your flap design. Grade the seam allowance if desired to eliminate bulk. Turn the case right side out through the opening. Press the edges smooth and flat with the seam pushed to the edges. Top stitch the edge using a guide, such as your sewing machine foot and needle position, to keep the stitching an even distance from the edge. Close the case and find the position for the loop tape. Pin the tape in place. Sew the tape in place, pivoting with the needle down, sewing through both fabric layers.